I'm in the process of re-reading some of Robert E. Howard's mythos stories and find overall that they have a somewhat different feel than Lovecraft's works. Howard's characters seem more active and Lovecraft's more passive in their interactions, and Howard seems to involve more direct conflict rather than simply investigation. I think that this style suits my game group better than traditional CoC and I would like to run some sort of "Howard Mythos" campaign. I don't care so much if it is done with CoC, d20 CoC, ToC, or other rules sets as long as I can capture the mood. (1) are there any CoC style rules sets that simulate a Howard type of play better than others? (2) are there any specific modules that are more Howard-like than the typical? (3) other than the Howard mythos stories, are there any good resources for that style of play? A!C with Savage Worlds or with 6e ll give you a more pulpy game as will using Astounding Adventures. Realms of Cthulhu, based on Savage Worlds. Personally I'm very interested to see what Pulp Cthulhu does. My players tend to prefer a similar style of play and over the years, while I really enjoy a classic "Purist" game occasionally, my real-life job has me dealing with enough grim issues that Pulp is often my go-to for enjoyment. As a result I came up with a series of rule additions that amped up character effectiveness and survivability. If people were interested I expect I could post them here or on my blog (with a link). Here are my simple rules for building that kind of adventure. 1- Mooks and Minions are for shooting, Masters are for sorcery. 2- There should be lots of shooting. 3- Investigators should be of iron will and steely disposition (e.g. high San). 6- Artifacts are important - sometimes they solve the Puzzle, other times that are the Puzzle, sometimes they lead to the Puzzle - and sometimes they are merely cool atmosphere! That about covers it in very, very short form. Oh, and another thought - get back to other source material. Watch the semi-recent Mummy movies, read or listen to some Shadow (or watch the semi-amusing movie), explore the world of Fu Manchu, read and watch some Tarzan again. These are the (easy to find) things I use for inspiration. The OSR style RPG Astonishing Swordsmen & Sorcerers of Hyperborea may be worth a look. It's a cross of 2nd edition AD&D-style fantasy with weird fiction elements from the Likes of Lovecraft, Smith and Howard. I am getting an itch to read some REH, got the Delphi Classics Complete Robert E. Howard on my ebook reader. I do have some old papers backs but they might fall apart if over used. The upcoming Raiders of R'lyeh game is specifically inspired by Howard-style Mythos tales. It's set in the 1910s. Also, there's the Cthulhu Pulp supplement for the Pulp Adventure RPG from Planet Pulp Productions that allows you to 1) put the Cthulhu Mythos into your pulp and 2) use any published CoC material with the Pulp Adventure rules. There's also Trail of Cthulhu's "Pulp" orientation. The rules are pretty clear about how to run campaigns that are Pulp, Purist or neutral. Hey Finarvyn! Long time, no see. Really (as I think RMP once pointed out), HPL and REH's protagonists/stories tend to run more along a spectrum. Sure, the actual narrator of most HPL tales tends to be somewhat passive. However, what about Legrasse and his men in TCoC? What about Johansen and the crew of the Emma? Those guys did some serious wetwork. Then you have up-close-and-personal combat by HPL protagonists in The Horror in the Museum and Dreams in the Witch-House. You have a frikkin' flame-thrower in The Shunned House. In the end, the "difference" between HPL and REH was as much about emphasis and POV as anything. In Howard's work, you see "passive" protagonists from time to time. REH's von Junzt, almost by definition, had to be "passive", to a certain extent, simply to infiltrate and then write about so many cults. If he decided to interrupt a horrid ritual, what would happen then? He had an overriding mission that outweighed such concerns. He had to bring the "bad news" back to an unbelieving Western audience. All else was trumped by that. Very "Lovecraftian". There are a few. REH's "weird menace" tales are one step away from the Mythos (due to editorial constraints). His detective yarns tend that way as well (see Price's Drug War of the Black Tong). That's the thing, Howard's stories all are set in the same universe (and part of the "Mythos universe" at large). A "pulpish" CoC campaign could, very easily, involve elements from REH's weird menace, detective and weird western stories. It could start in New Orleans and end in the "Valley of the Lost." Or, you could even extend things clear to China from there. Robert E Howard has blazed the trail for you. The thing to remember is, essentially, that Skull-Face is a "weird menace" tale and, yet, HP Lovecraft was all about it. There is no doubt in regard to that. HPL brought up Kathulos in numerous letters to other members of the Circle. Keith Taylor and myself spent months collating all of REH's fiction, all of the clues about von Junzt and synthesized that with Lovecraft and the Mythos at large. All of the Easter Eggs therein should keep you busy for a long time, I hope. Hey, Deuce! I don't get out as much as I should. I do stop by the REH forum sometimes but often don't feel like I'm qualified enough as a "scholar" to post there as much as I'd like. I do enjoy REH's detective and "weird menace" stuff and will follow up on the link you posted above. Just finished "God in the Bowl" which I think you could classify as a Conan, Detective, Mythos story. Note from HPL to Robert Barlow, complete with envelope addressed to Barlow by HPL (his return address written on the back). Six line written note, commenting on Robert E. Howard's story, "The God in the Bowl." In the next [REHupa] blog post, written after the event, Bill Cavalier posts a picture of the note. From what I can make out, it appears that Lovecraft read GitB with "keen interest and appreciation" and that "The climax of 'The God in the Bowl' is splendidly vivid!" There are some who don't seem to realize that HPL enjoyed several Conan tales. It would appear that when he didn't, it was usually because of the inclusion of a "romantic" element of some sort. Lovecraft held the same kind of thing against A. Merritt (whom he otherwise greatly admired). The "climax" that HPL refers to has Conan getting a clear view of the abomination he'd just slain and running in terror until dawn. The thought of Set was like a nightmare, and the children of Set who once ruled the earth and who now sleep in their nighted caverns far below the black pyramids. "...Nyarlathotep, who in antique and shadowy Khem even took the form of man?" I believe Set is just another form/name of Nyarlathotep, BTW. I've never played it, but I have the rulebook and D20 CoC has a decidedly heroic/pulp feel to it compared to the BRP rules... for that matter, traditional D&D is probably close in spirit to this sort of thing, simply by limiting the selection of monsters and PC classes. The "pulp" CoC rules are intended to emulate the same spirit of things, and I'd assume we'll be seeing some version of that this year as part of the 7E CoC Kickstarter, though the history of that Kickstarter is such that it's probably not best to hold your breath until the finished product appears (looks like they've been getting things done for that Kickstarter and what's done looks fantastic, but the pace toward completion has been glacial). And I agree: Awesome stuff, deuce! Come to think of it, Lovecraft having an aversion to romantic plots would explain a lot about some of his more puzzling bad reviews of books and movies - from that point of view, I can imagine that the romantic elements of RW Chambers' King in Yellow wouldn't have gone over well with Lovecraft, explaining Lovecraft's impression of the work being uneven, and it sounds about right for a motivation for Lovecraft's dislike of the early Universal horror films, too. I can easily imagine Lovecraft enjoying the Conan stories, in any event. .And I agree: Awesome stuff, deuce! Come to think of it, Lovecraft having an aversion to romantic plots would explain a lot about some of his more puzzling bad reviews of books and movies - from that point of view, I can imagine that the romantic elements of RW Chambers' King in Yellow wouldn't have gone over well with Lovecraft, explaining Lovecraft's impression of the work being uneven, and it sounds about right for a motivation for Lovecraft's dislike of the early Universal horror films, too. I can easily imagine Lovecraft enjoying the Conan stories, in any event. Basically, the young HPL sycophants in the Circle (Long, Bloch and Derleth) were the ones who despised the Conan stories en masse. Poor Robert E. Howard was and still is, I think, one of the most misunderstood members of the "Lovecraft Circle". Up until last year, I think almost my only exposure to Howard's fiction was from the 1980's Conan movies, and one or two stories in anthologies ("The Black Stone"). When I read an anthology of early Conan stories, I was rather surprised by what I read - it doesn't at all resemble the "brainless, muscle-bound, low fiction" I'd been hearing it dismissed as. It's a lot more subtle and delicate work than it seems that some of Howard's harsher critics would give him credit for. There's even a great deal of deliberate irony in referring to him as "Conan, the Barbarian" - Conan was always far less a barbaric savage than both his own countrymen and especially any of the "civilized" peoples that appear in the stories... Conan seems to be balanced somewhere between the brute wickedness of degenerate, ape-like savages, and the more calculated and sophisticated evil of men at the height of civilization. I suppose it's some of the same ground covered by Edgar Rice Burroughs a generation before (I'm certain that Howard would be one of the first to say that there probably wouldn't have been a Conan without Tarzan and John Carter being there first to blaze the trail), but as much as I enjoyed Burroughs' work, Howard seems to hit this theme of civilization-and-savagery as opposite sides of the same barbaric coin with a stronger philosophical vision, greater imagination, and more subtlety than Burroughs did. Anyway, I'm glad I ignored the nay-sayers, and finally gave the Conan stories a try - I'm looking forward to reading more of Howard's fiction! I know that the REH Foundation will have a vendor's table at the Con. 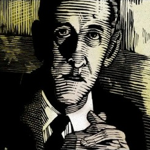 Also, the REH panel..."Join us for this panel and learn more about REH, his contributions to the Cthulhu Mythos, correspondence with HPL and how Howardâ€™s work remains so vibrant and powerful all these decades later! Shanks and Burke have worked on several Mythos-related scholarly projects. Connors is a CAS scholar, a member of the EOD as well as the REH apa. Shanks will also be on the the Pulp/Fanzines panel, the HPL and science panel (as the archaeology/anthropology), and on Friday he'll be giving an academic paper in the Armitage Symposium entitled "Darwin and the Deep Ones: Evolutionary Anxiety in 'The Shadow over Innsmouth.'" He is the co-editor of The Unique Influence of Weird Tales academic volume coming out soon. They shouldn't be that hard to find, Nick. A couple of things I should've mentioned... The REH panel is 4pm Saturday. Mark Finn wrote the award-winning Howard bio, Blood & Thunder. GREAT panel on this at the 'con. Lets hope someone taped it.